Confirmation of macrophage TGF-βRII deletion. Peritoneal macrophages from Tgfbr2fl/fl (WT) and LysM-Cre Tgfbr2fl/fl (macrophage TGF-βRII–/–; MφTGF-βRII–/–) mice 3 days after peritoneal thioglycollate administration were used. (A) TGF-βRII levels were markedly lower in TGF-βRII–/– macrophages than in WT macrophages. ***P < 0.001, n = 3 in each group. Data were expressed as mean ± SEM. (B) Macrophages were stimulated with 2 ng/ml recombinant TGF-β for 30 minutes. 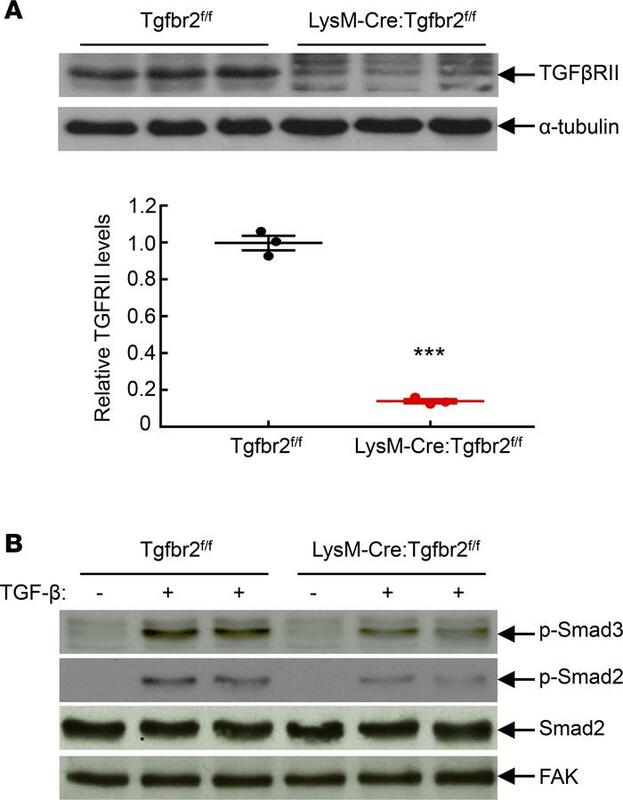 TGF-βRII deletion led to decreases in TGF-β–stimulated phosphorylation of Smad2 and Smad3, an indication of TGF-βRII deficiency. p-Smad3, phospho-Smad3; p-Smad2, phospho-Smad2; FAK, focal adhesion kinase.